WHERE: Pool, Redruth, Cornwall, England. WHAT: red breasted British robin. MAP: Pool. Thumbnail click pops-up larger image. When food is scarce, British robins especially can be trained to approach closely, or even to take food directly from human hands. It is said that mealworms are irresistible to these birds. Although they are cute, the males will fight each other to the death over a territorial claim. The picture shows a robin whose territory includes Charles Winpenny's garden. We presume they live peaceably in the shared space. We had occasion to update a 2002 feature about European and American robins, and the information is reproduced below. Jean Palutikof has a page about the indicators of climate change in the UK on the climatic research unit web site. He says "A recent analysis of 65 species shows that 20 species have tended to lay their eggs 4-17 days earlier in the year over the past 25 years. Birds have evolved to lay their eggs so that nestlings are hatched when food is available and there is food when they leave the nest. Laying dates are therefore strongly related to spring (especially March) temperatures." There is a data table showing the date on which 5% of the observed robins (erithacus rubecula) had started laying. This species, shown in the left hand illustration, is the much loved British robin that is so often shown on Christmas cards cutely perched on a spade handle with head cocked, which is something they actually do in reality! Where I live now there is a throng of much bigger, but equally attractive, american robins. Ed Badger is the webmaster for the town of Hudson, NH, where they also have American robins. Ed has a page recording the birds visiting the feeding station at 12 Saint Laurent Drive, Hudson, New Hampshire. The illustrated list contains some other colorful visitors: northern cardinals, blue jays and American goldfinches. There is an unwelcome visitor too, a red tailed hawk (a species that appeared in an earlier item at that link), which is unafraid of Ed, and has killed at the feeding station. Readers wanting more details on the European robin should check out the RSPB (Royal Society for the Protection of Birds) web site, where there are pictures of an adult robin, and an adult robin in full song, with a useful robin identification guide. The RSPB site has extensive resources online, including webcams plus still images, and joining the RSPB helps them to continue working to protect birds, wildlife and habitats. RSPB membership costs are: families £45.00GBP (full RSPB membership for two adults, and RSPB junior wildlife explorers club membership for all children living at one address); joint membership £36.00GBP (full RSPB membership for two adults at the same address); and single membership £27.00GBP (full package of membership benefits for one adult). As a former member when I lived in the UK I can attest that with the quarterly magazine, and admission to RSPB reserves, all these packages offer great value with the opportunity for ordinary people to explore the bird world. For North American readers, the 435 illustrations by John James Audubon are a national treasure. The American robin (turdus migratorius) features in plate 131 of that enormous work. Many of Audubon's prints are still for sale, but for those of us with challenged disbursable incomes Haley & Steele, sellers of fine art since 1899, offer an Audubon information gallery, and a FREE (3.5Mb, email address required) PDF format guide by Robert McCracken Peck & Ron Tyler, packed with beautiful illustrations. In the more modern medium of photography, there is a comprehensive information section on the USGS (US geological survey) web site, and Kevin Dougherty has an American robin webcam in his backyard. 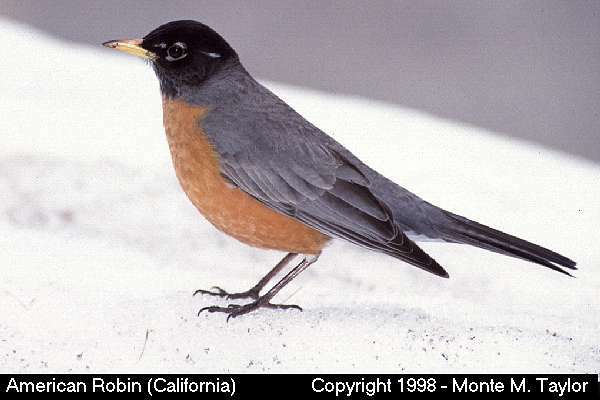 The slick NWF (National Wildlife Federation) eNature.com web site has lots of excellent pictures, including the clay-colored robin, a rare visitor to the Rio Grande valley in Texas, all in searchable galleries that can even return all the common species based on a US zipcode query. The web site of Monte & Christopher Taylor offers pictures of 785+ bird species, mammals, and cetaceans, all photographed by the site authors, of free and wild creatures. 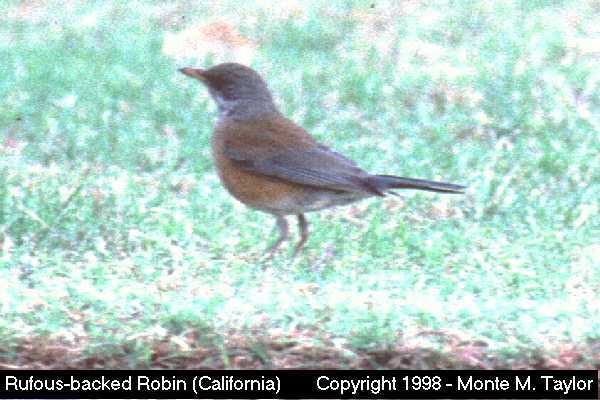 The Taylors have a picture of an American robin, and also a picture of the much rarer (though poorer quality image) of the rufous-backed robin.